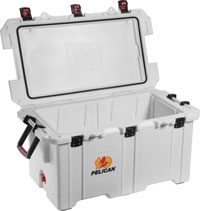 *Ice retention - Initial test results are based on the Pelican 65Qt Elite Cooler model. Testing was conducted using forced air circulation in a temperature controlled environmental chamber at 90 degrees F. The test specimens were loaded to capacity with commercial cubed ice. Performance will vary by model size and external user conditions, such as; (sun exposure, wind, ice type, frequency of opening, etc.). 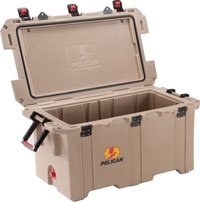 (114 x 63.5 x 61.9 cm) 34.00" x 17.00" x 15.75"